We helped the Boy Scouts regional office move out their office furniture from their Wayne, Pa. regional offices while their space gets renovated and upgrades. Not sure why it hapens but these office cleanouts always seem to happen on the hottest days of the week. No matter our truck teams took out a number of truck loads of old office furniture and file cabinets which were sent off to the recycle center. Our commercial truck teams have had a busy year doing office building cleanouts one right after the other. We also have taken down a number of larger barns this season. 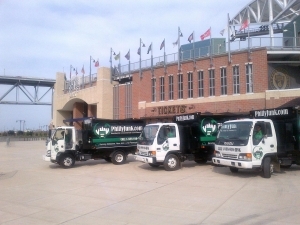 If you have a commerical property or light industrial building that needs emptied give PhillyJunk a call. We certainly have plenty of experience doing office furniture cleanouts. Need a wood shed or garden shed removed? Not to worry, PhillyJunk removes wood and metal sheds almost daily. Our team comes in and dismantles the shed then loads and cleans up the area before disposal of all of the contents. We simply charge by the amount of space the shed takes up in our trucks once dismantled. Some sheds are easier to remove than others. Even if you have a large shed or wooden barn we will come equipped with the right tools and trucks for the job. PhillyJunk dismantles sheds, hot tubs, large wooden structures, jungle gyms, swing sets, or just about any other type of wooden structure then loads the material, cleans up all the lose debris and sends it off to the recycle centers. Call PhillyJunk if you have a tool shed, garden shed, wood shed, metal shed or any other wooden structure you need removed.